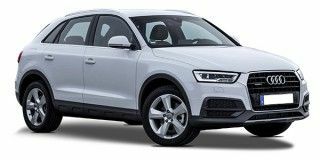 Audi Q3 Design Edition 35 TDI quattro is the mid diesel variant in the Q3 lineup and is priced at Rs. 40.76 lakh (ex-showroom, Delhi). This base variant comes with an engine putting out 184bhp@3500-4000rpm and 380Nm@1750-3000rpm of max power and max torque respectively. The gasoline motor comes mated to 7-Speed S-Tronic Automatic transmission which is quite a joy to use. Audi claims an average of 15.2 kmpl for this mid Design Edition 35 TDI quattro variant. Addtional Comfort Features : Audi Drive Select, Electromechanical Parking Brake, Folding Rear Seat Back, Space Saving Spare Wheel, Auto Release Function, Available Modes: Comfort,Auto and Dynamic, Coat Hanger "